We often hear about corporate trust, corporate reputation or leadership but rarely about source and corporate credibility. Experts frequently try to convince corporate professionals and spokespersons to follow rules and tips, or a 10-step process to improve their credibility. Or even worst, how many times did you hear that a spokesperson needs only expertise and charisma to be credible? It is actually a wrong understanding of this fundamental skill and powerful intangible asset that is credibility. Based on a research realized in the early 2000 (now under review by its author), it is impossible to build and maintain credibility through a 10-step miracle process sold by charlatans, credibility lives and dies within an open system (Prud’homme, 2004). A central topic of systems theory is self-regulating systems, i.e. systems self-correcting through feedback (Wikipedia). 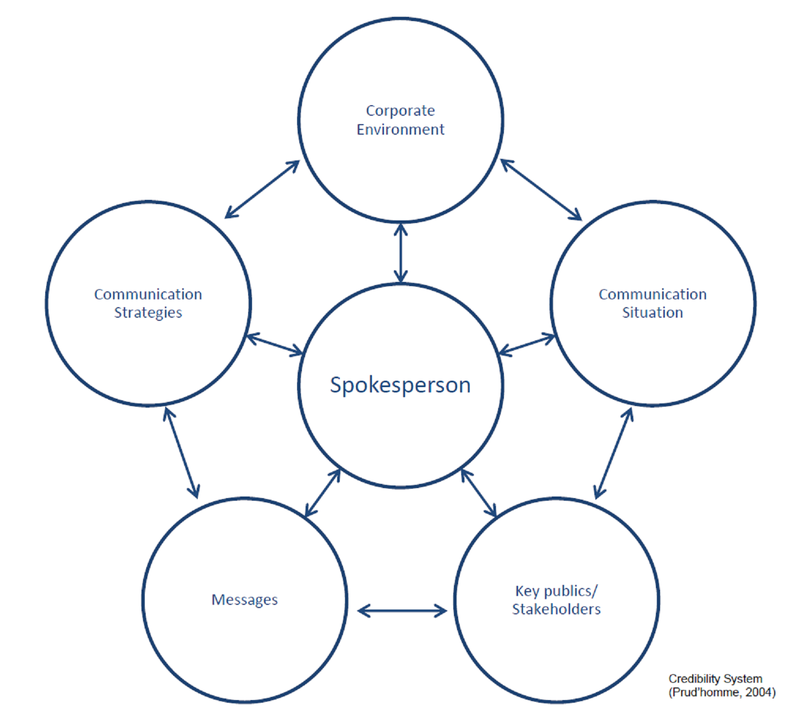 In the following figure, it is possible to see the typical spokesperson’s credibility system with a general view as well as the five elements and the different interactions between them. 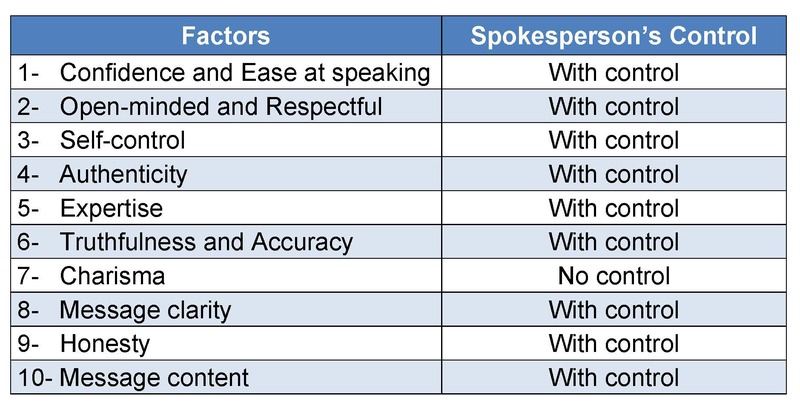 These five elements, individually or all together, could have major impacts on a spokesperson’s credibility, whether it is a communication dramatic situation, e.g. a crisis, powerful stakeholders attacking the corporation’s reputation, messages not adapted to a situation, bad communication strategy associated to a wrong public targeting tactic, all that might lead to a disaster in terms of losing credibility, especially in a crisis situation, during which everything is accelerated, as we all know. Once practitioners and leaders understand credibility as an open system, they can start to appreciate the system’s elements and the interactions between them as well as the factors that structure and build corporate spokesperson’s credibility. In the same study (Prud’homme, 2004), it has been found that ten credibility factors/components influence the population to judge a spokesperson credible or not, because at all times a spokesperson is credible only in people’s mind, his/her audience. As you can see in the following table, the top-10 factors are common sense. But what was new in this research is how to integrate these factors to a credibility system and how to build and maintain (and even regain) credibility. 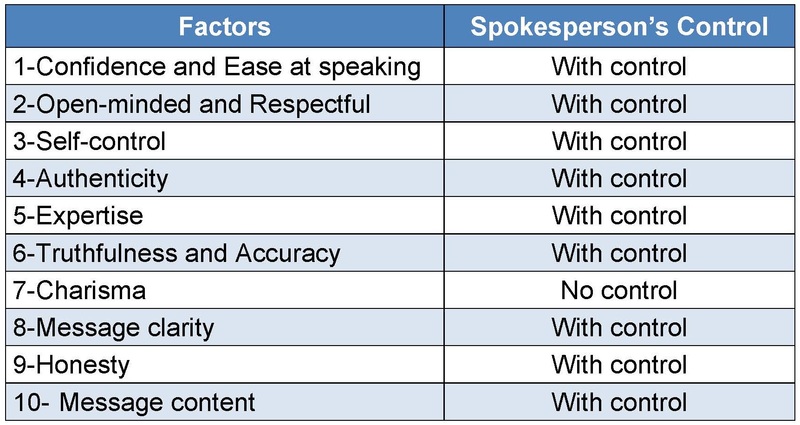 As it is possible to see in the right column of the table, a spokesperson can control almost all of them, except charisma. Some scholars say that some leaders are able to develop charisma, it is true indeed, but it is harder to develop charisma than exercising control on the other factors. Credibility is not only related to influence and persuasion, but also to the act of informing, communicating, having a dialog with an audience, receiving feedback. That is to create and maintain a relationship of trust and sharing between a spokesperson or a corporation and their publics and stakeholders. We must understand that credibility exists only in function of a reflection or a perception, it does not exist by itself, it starts in the mind of every member of an audience. A spokesperson is not credible because he/she thinks that he/she is credible, it is only how the audience perceives his/her credibility. Credibility does not equal effectiveness. A credible spokesperson sincerely wishes to establish and maintain a relationship of trust and mutual understanding with his/her publics rather than being effective. I mentioned “dialog” because credibility is a two-way symmetrical communication (Grunig and Hunt, 1984). A credible spokesperson always demonstrates a great flexibility and a mindset of openness along with a constant authenticity. To be credible, a spokesperson should know his strengths and weaknesses, because above all, he/she is a human being in a complex and uncertain environment (Prud’homme, 2004). Finally, we must understand that credibility is built, managed and can be strengthened, but never won (Prud’homme, 2004) and that anyone should avoid at all costs to perform miracle recipes such as: “10 steps to become an effective spokesperson” coming from public speaking best-seller handbooks. Credibility is lived day by day. It is a lifestyle one chooses to live or not. Credibility reinforcement is an arduous and long-term approach that positively contributes to build trust and reputation as well as a sharing and constructive dialog between a spokesperson and the population. A fact that so many practitioners and leaders forget is the primacy that credibility has over trust and leadership. It should be easy to figure that if there is no credibility, there is no trust, no leadership. Therefore, trust and leadership should be considered as credibility’s crucial elements. It is especially true in crisis management. How a spokesperson and a corporation could be trustworthy and recognized as a leader, two major considerations in crisis management, if there are not credible? Why a corporation should invest to build credibility? Managers who do not believe that they should seriously prepare for possible crisis to arise are not able to answer this question and they probably already stopped reading this blog anyways. Credibility brings not only an impressive return on investment (ROI) to corporations in terms of two-way symmetrical communication and a powerful and long-term relationship with all stakeholders, but it can also save corporations from a disaster originated through a crisis or even solve it. It also contributes to reduce uncertainty. The only constraint when a corporation decides to work on its credibility is the time, and in business, time is cash. People do not realize how long it could be to build a credibility sound enough to help them to get out of a crisis situation or to build a relationship with stakeholders. We often say that it takes years to build credibility and it takes hours to lose, and it is so true. On the long run though, it is worth to invest time as well as above-the-line, below-the-line and through-the-line capital. Why your publics and your stakeholders should listen to you when you try communicating about a crisis or an issue if they do not believe you at first? Keywords: Credibility, source credibility, corporate credibility, spokesperson, trust, reputation, crisis, crisis management, uncertainty, return on investment, ROI, two-way symmetrical communication, management, leadership. Next What are Electronic Public Relations, ePR, Digital PR?